OK, listen up. I have another good idea. I acknowledge right from the start that not all of my ideas are winners. Some of them have led to injury, property damage and the possibility of arrest. But this is a good idea. I call it “Bizarro Daily Fantasy Baseball,” (or BDFB). 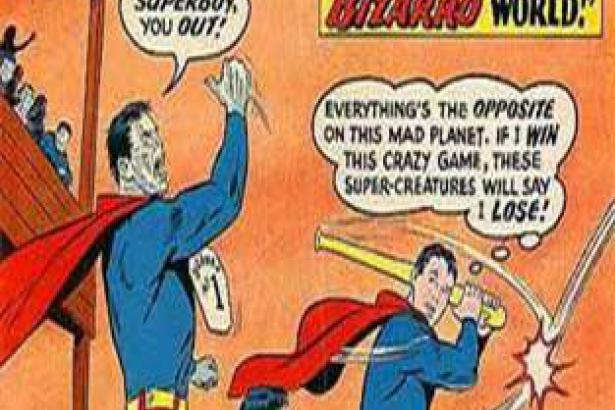 For those of you who didn’t waste your youth reading Superman comic books, the Bizarro people were sort of chalk-white Frankenstein-ish mirror clones who said and did things in the opposite of how we humans would say and do them. Also they were kind of dumb and mean. I never liked those issues of the comic books and would trade them for almost any other titles, though I drew the line at Josie and the Pussycats (who were also a terrible band, lacking the musical depth and lyrical intensity of The Archies). There’s also an excellent single-panel Bizarro syndicated comic by Dan Piraro, but that has nothing to do with my idea. Where was I? Oh, yeah—BDFB. Since the point of real DFS is to build a roster of players with the best stats, BDFB owners will try to build rosters with the worst stats! At last, coveted roster slots for Alcides Escobar! And Ian Desmond! At last, the chance to bolster a rotation with Alfredo Simon! Or Jered Weaver! Somebody call the New York State Attorney General’s office! Somebody take away the exclamation point key! But seriously, it could be lots of fun once in a while to have a team full of players to root against. It could be fun to have a homer be bad for your hitter but good for your pitcher, and the reverse for a strikeout. It might be interesting to watch a game with your pals and be able punch the air with a resounding, “Yes!” when a guy hits into a double-play, and then tell your pals that you have the batter on your DFS roster. Bizarro, indeed. Once I had conceived this duckling of an idea, I had to work out the details to hatch a swan. Working on it had the added advantage of giving me something to do while I was avoiding my tax returns, which are due here in Canada on May 2nd. I wanted the BDFB structure to resemble DFS in its relative simplicity. One thing I like about DFS is that all the scoring is based on the kind of plays we can see in a box score or while watching or listening to a game. A baseball game full of cheers and groans, that’s what we want. The aim of the scoring value was to end up with player scores that would look like regular DFS outcomes. Overall, using 2015 stats, hitters generated about 8 points per games, with lows around -7 and highs in the low 20s. Pretty DFS-ish. The average pitcher scored around 13 points per start (only starters allowed in BDFB), with lows around -3 and highs around 30. Again, pretty close. Escobar had a median per-game score of 8 points, with half his games in the range of 8-17 points. He had positive points (that is, poor performances) in 85% of his games, including a massive +25 in one memorable disaster, in which he went 0-for-6 with a strikeout and two GIDP. Attaway, Alcides! His low score was a -7 in the last game of the 2015 season, with a 2-for-4 plus a walk, 2 Runs and 3 RBI. Harper’s median game score was 3 points, with half his games in the range -3 to +5. His high was 16, an 0-for-5 with a strikeout. His low was -24, a 3-for-4 with 3 taters, 3 Runs and 5 RBI. Weaver’s median game score was a solid 13 points, with half his games in the range 10-21. His peak performance was a 30.5, a delightful disaster of 6 IP, 8 ER, 9 hits and 4 walks, a HR and an HBP, and just one K. Remarkably, he won the game, costing his Bizarro owner two well-earned points, and reminding everybody who doesn't already know it that wins are dumb. Weaver's low game for the year was a -2.5—his only negative score for the season. Jered Weaver is a Bizarro BDFB ace. Scherzer’s median game score was 0.5, with half his games in the range -3.5 to 1.0. His low score was -27 (an Opening Day 17-K no-hitter), and his high game was a + 14, a three-inning loss with seven hits including two HR, a HBP and a WP, and only 3 K. Eighteen of his 33 starts were negative. Figuring out the scoring from 2015 also involved racking up every hitter over 150 PA and every pitcher over seven starts and 30 IP, then sorting them by overall Bizarro points per game. That’s how I identified Escobar and Weaver as Bizarro studs, although watching them play last year was a pretty good clue. If you’re wondering about player salaries and other rules of play, we’ll have to wait until one of the big DFS companies sends me a big, fat cheque (Canadian, remember? ), preferably in U.S. funds. In the meantime, I certainly don’t want to deal with the New York State Attorney General’s office. So keep all this under your hat. Finally I was interested in some of the other names from the top and bottom of the overall Bizarro lists, because they surprised me. I mean, if you see Alcides Escobar or Mike Zunino on a list of ineffective hitters who ring up plenty of bad plate appearances, you don’t put in a call to Ripley's Believe It Or Not. But if you see Jacoby Ellsbury or Yan Gomes, you might be at least a little flummoxed. Other top-10 hitters after Escobar: Ellsbury, Jean Segura, Gomes, Jose Reyes, Gerardo Parra, Zunino, Ian Desmond, J.J. Hardy and Angel Pagan. Among the bottom hitters: Andres Blanco, Harper, Andrew Romine, J.B. Shuck, Ezequiel Carrera, Ryan Raburn, Alejandro De Aza, Clint Robinson, Dustin Ackley, David Murphy, Justin Smoak and Chris Young. Similarly, seeing Alfredo Simon, Shane Greene or Jason Marquis among top high-scoring (meaning terrible) pitchers wouldn’t raise an eyebrow. But Johnny Cueto and Jeff Samardzija might. Among other top scorers: Kyle Kendrick, Kyle Lobstein, Wily Peralta, Dillon Gee, Jeremy Guthrie, Mike Leake, Mike Pelfrey, Ivan Nova, John Danks. And here are top 10 lowest-scoring pitchers are like the Cy Young ballots: Clayton Kershaw, Jake Arrieta, Max Scherzer, Jose Fernandez, Chris Sale, Zack Greinke, Stephen Strasburg and Jacob deGrom, but also including J.A. Happ and Drew Smyly. Makes me glad I got Happ in AL Tout, and wish I’d got Smyly. That's my idea. Now it's up to you to go start a Bizarro daily league with your friends. And have fun picking your bums!